All those who had pre-booked the album before that date shall receive a signed card. Bengans Postorder ( postorder@bengans.se ) if you have any further questions. We’ll do our best to keep you satisfied. And to those slagging off Bengans for this you are not being fair! 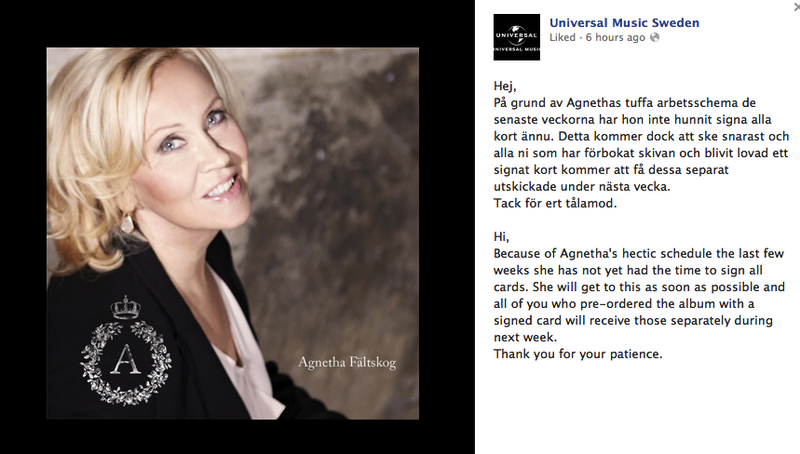 The only people to blame are 1.Agnetha for not doing them in time 2.Universal for not pushing this. Give Bengans a Break they offer an excellent service. Agnetha on Graham Norton BBC. Comments : Comments Off on Agnetha on Graham Norton BBC. Agnetha Fältskog’s extraordinary singing career began when she was only 15 years old. But in just two years she was knocking The Beatles off the top of the Swedish pop charts writing her own material. This new programme features exclusive access to Agnetha in the studio and with her colleagues of both recent years and from ABBA, assessing and celebrating her journey as Sweden’s ‘girl with the golden hair’. Her self-penned debut single “Jag var så kar”, (I Was So In Love) sold more than 80,000 copies and she fast became one of Sweden’s most popular music artists. However, a chance meeting with Björn Ulvaeus led to her marriage, winning Eurovision and the phenomenal ABBA years. With ABBA’s success came hard work, TV appearances, vast crowds, demanding tours and for Agnetha being away from her children eventually caused her great turmoil. Agnetha loved being in the recording studio, and Frida and Agnetha without doubt gave the ABBA songs a distinct sound. However, many argue that ABBA would not have reached the same heights without Agnetha’s pure voice and arresting beauty. For this shy girl from the small Swedish town of Jönköping it was a struggle to match up to co-star Frida who had such confidence and a natural flair for performing. After a much-publicised divorce from Björn, and as ABBA eventually came to an end, Agnetha briefly tried to build a solo career with moderate success until she eventually walked away from the public eye traumatised by fame. Since then, the world’s press has engaged in an endless game of conjecture about the private life of a women catapulted to international stardom in 1974. But now, after 25 years, Agnetha Fältskog has stepped back into the limelight with new material after working with successful writer Jörgen Elofsson, who has written for artists such as Britney Spears and Westlife. Back writing again herself, she has also recorded a duet with singer-songwriter Gary Barlow on the album. The vocals were recorded separately and, exclusively in this documentary, Gary Barlow meets Agnetha for the first time. Sarah Dawn Finer – The Winner! The TV-live version of “THE WINNER TAKES IT ALL” from the ESC finale last night. Thank you SKAP for giving me a songwriting scholarship and award tonight. What an amazing honor! I am so inspired and so happy that you believe in me as a songwriter. Thank you! Comments : Comments Off on Sarah Dawn Finer – The Winner! Benny Andersson is a musician, composer and feminist. Founding member of Swedish pop sensation ABBA and composer of beloved musicals like ”Mamma Mia” and ”Chess”. In this post he shares his thoughts on gender equality with the help of the film The Hours (2002) by Stephen Daldry. “I had an idea of our happiness!“ says John C Rilley’s character Dan Brown to his wife Laura, played by Julianne Moore, in a scene from The Hours. While she reluctantly listens, he tells her and their son about when he was stationed in the South Pacific during the war and how he was determined to give her a home and a life. He seems to be a very kind man, who would do anything for his wife. Yet, we see a husband who regards his life partner as just a mere extension of himself. Eventually, after being forced to the verge of suicide by this intolerable patriarchal state of things, Laura deserts her family. Food for thought, isn’t it? This story takes place in the United States during the 1950′s, but has the situation really changed? We would generally say in Sweden that we have come a long way on the path of gender equality, but if you ask me, the longest distance is still to be covered. How about starting with equal money for equal work? As for another film: Does anyone believe that the screenplay for Straw Dogs (1971) could have been written by a woman? Abba singer Agnetha Fältskog’s new album A has reached number six in the UK album charts, making it her highest-charting solo record in Britain. The 63-year-old blonde member of Abba withdrew from public life after the hit Swedish band split, but has been tempted out of retirement by lyricist Joergen Elofsson, who has previously written songs for Britney Spears, Kelly Clarkson and Westlife. The album also features a duet with Gary Barlow, whose vocals were recorded separately, which has been described by critics as “annoyingly good”. A is Fältskog’s fifth solo album and her first in almost ten years after she recorded My Colouring Book in 2004, which reached number 12 in the UK album charts. Her previous 1988 record I Stand Alone came in at number 72. Speaking about her decision to re-emerge on the music scene she said: “It is nearly 10 years since my last album, and almost 25 years ago since I recorded my original material. I thought at the time that maybe that would be the last one. And after that, I really didn’t think that much about it. Fältskog was one quarter of Abba along with her former husband Björn Ulvaeus and her friends Anni-Frid Lyngstad and Benny Andersson. Together they sold 370 million albums and singles worldwide. Her distinctive vocals can be heard on “Waterloo”, “The Name of the Game”, “Chiquitita” and “The Way Old Friends Do” among others. Fältskog and Ulvaeus divorced in 1980 but they continued to perform as Abba until late 1982. ABBA Now have Claim to The Second Biggest Selling Album In UK -EVER! Abba’s greatest hits collection, Gold, edged past the The Beatles’ Sgt. Pepper’s Lonely Hearts Club Band this weekend to become the second highest selling album in UK history. The band have now sold over 5.1million copies of their greatest hits album, with the Official Charts Company indicating over the weekend that the album has surpassed Sgt. Pepper’s by 15,000 sales. The album now only sits behind another best of collection, Queen’s Greatest Hits, which has so far sold 5.9million copies. The rest of the top five consists of Adele’s 21, which is 4th having sold 4.6million copies, with Oasis’ 1995 sophomore release (What’s The Story) Morning Glory?completing the top five, selling slightly less than Adele. Speaking to OfficialCharts.com, ABBA founder and songwriter Björn Ulvaeus spoke of his shock at the achievement, saying, ‘It’s feels unreal – outselling the greatest record of all time! ‘The new album knocks Sgt. Pepper’s Lonely Heartclub Band from the number two spot and is less than a million sales away from knocking Queen from the top spot. Gold‘s chart success couldn’t have come at a more fitting time either, with the Eurovision Song Contest; the competition that launched ABBA to international stardom, returning to the group’s native Sweden this weekend. The weekend also marked a return to the U.K. charts form former ABBA singer Agnetha Faltskog, whose comeback album A reached number six in the charts following Sunday’s (May 19) update. The new album knocks Sgt. Pepper’s Lonely Heartclub Band from the number two spot and is less than a million sales away from knocking Queen from the top spot.